Overall I'm quite pleased with the result over my previous dashcam, a VC-250 Dash Cam with GPS. Though I miss the remote on the VC-250 to trigger protecting of videos from being overwritten. Finding and pushing a button on the camera while driving is not practical. That experience taught me too an interior cam is about worthless for seeing out the back. Which is why I mounted a Rexing V1 3rd Generation 4K camera facing front and a Rexing V1P mounted on the rear window with its remote cam inside pointed forward to catch an inside and bit of side view that might be needed. The over all effect is almost a 360 exterior view plus interior. Decent audio on all streams makes syncing the stream almost automatic in a editor like Adobe's Premiere Pro. Here is a quick multicam video I made from my Rexing V1P rear mounted camera and my forward mounted Rexing V1 3rd Generation 4K. 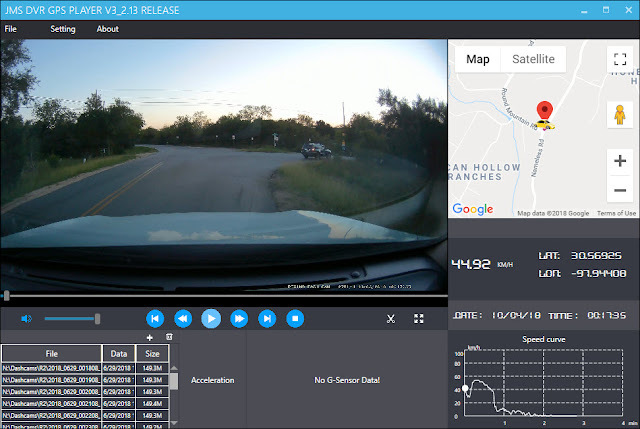 Elements from the each cam are overlayed to keep the SUV in view and the GPS speed and time readings. It is an example of the clarity of the cameras and how they can show evidence if you need it. For example in the above thumbnail I mixed the video down to the 1080p rez of the Rexing V1P forward (my back view) stream, overlayed the interior view from the Rexing V1P's remote cam and overlayed a zoomed in image from the Rexing V1 3rd gen to show the lights and a cropped but dull rez shot of the Rexing V1 3rd gen's data overlay at the bottom to show speed and time. Lastly I added text. With something like Adobe's Premiere Pro it is not all the hard but not so easy you would normally do without reason. I did a post digital zoom on the 4K stream to highlight what was happening. Note the 2X, 3X and 4X flash in the lower right to indicate that it has reached that level of zoom. (The editor smooths the changes in zoom so you might not even notice them.) The picture near the end is still pretty clear at 4X zoom. Better than a lot of 720p cams I've seen unzoomed. Note the raw video has GPS data encoded if you have options GPS. If you use the JMS DVR GPS player to view the videos you get a screen like this. This is one of the improvements over the VC-250 that you had to convert the videos to see them outside of their app and after converting you lost the GPS data. Note I replaced the audio on these to avoid audio book copyright issues.